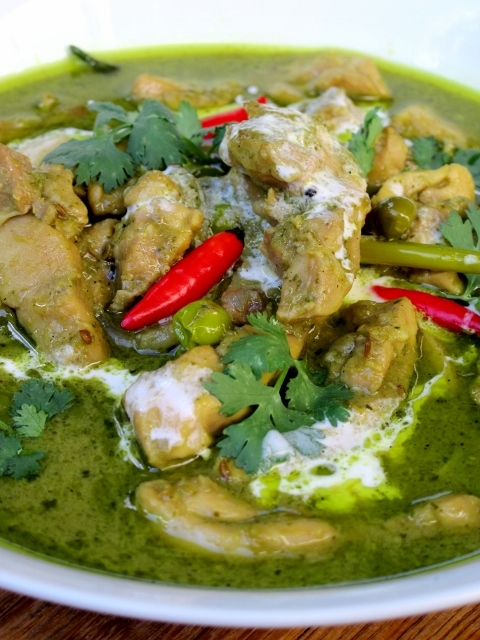 Arguably the most famous curry in the world, Green Curry is, for many of us, the poster-child of Thai cuisine. Disarmingly unintimidating, delicious and rewarding to make, it is hardly surprising that Green Curry has the equivocal honour of being as synonymous with Thailand as Spaghetti Bolognese is to Italy. In spite of the fact that it is a true Thai classic, Green Curry is actually remarkably easy to make at home. The first thing to consider is your curry paste and the eternal debate between homemade or store-bought. Whilst there are a wide range of fantastic ready-made pastes available, many recipes and chefs wax-lyrical about the absolute necessity of making your own, insisting, “that’s how its done in Asia”. Poppycock! Now I’m not suggesting you shouldn’t make your own, I’m just saying you mustn’t get too hung up on doing so. The truth is that the only Asians making their own curry pastes are those who’s job it is to do so. Okay, so whilst I do concede that a homemade curry paste is almost always nicer than store-bought, they invariably require a long list of ingredients that are difficult to source and often impossible to substitute. As part of this recipe I have included a homemade curry paste and the final dish is all the more rewarding for it, but if you can’t be bothered making it or you don’t have the ingredients, don’t despair – there is no shame in using a store-bought paste instead (as I often do). Thankfully, as with most curries, the success of the dish actually relies more on technique than ingredients; so rather focus on how you make the curry and less on the provenance of your paste. The chances are your curry will still turn out great!